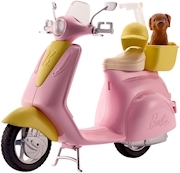 Scoot into fun with this Barbie® moped. It comes with a pet friend who’s always ready to ride! Designed in pink and yellow with silvery accents, the moped is trendy and stylish. Place Barbie® doll (sold separately) on the seat where a clip holds her in place. Lift up the kickstand and push to head into imagination. Bring along the puppy in the yellow basket on back. And a yellow helmet for Barbie® doll lets her ride safely in style. Whether you are going for a short ride or driving into adventure, this moped is ready to roll! Includes Barbie® moped with basket, puppy and helmet; doll not included. Colors and decorations may vary. Features: ? This Barbie® moped is ready to roll! ? It comes with a pet friend to share in the fun! ? The scooter is trendy designed in pink and yellow with silvery accents. ? Place Barbie® doll (sold separately) on the seat where a clip holds her in place -- lift up the kickstand and push to head into imagination. ? A yellow basket on the back is perfect for the puppy to ride along. ? A yellow helmet for Barbie® doll keeps her safe and is a fun accessory.